World-class quality is available in the heart of the Disney Springs™ Resort Area at the 325-room, 18-floor Best Western Lake Buena Vista Resort. 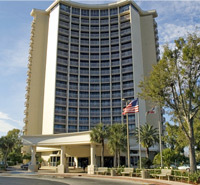 325 spacious rooms including 4 atrium suites. All rooms have private furnished balconies (except suite floor), 2 queen or 1 king size bed, coffee/tea makers, hair dryers, Web enabled remote cable TV with pay movies and Internet games, Wi-FI Internet Access, Bath & Body Works Amenities, electronic safes, AM/FM alarm radio, iron and ironing board. Rooms can accommodate four to five guests.